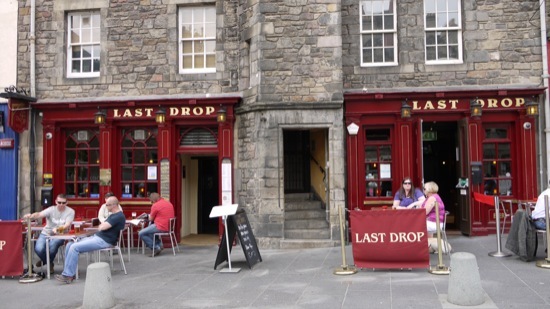 While out enjoying your vacation in Edinburgh you are going to want to do as the Scots and enjoy a nice, well deserved pint, in one of their many pubs. Won’t come as a surprise to say that the Scots like to drink, and because of this the options for places to have one is long and winding. The following suggestions should give some insight into another wise difficult decision. There is that pub right by your hotel or hostel, or if you’re feeling more inspired try one of these. Edinburgh is not a city blessed with a lot of sunshine, for that reason it can’t be a shock that there are not that many great beer gardens. Adjacent to Edinburgh University in the Old Town the Pear Tree bucks that trend. Complete with a cobbled patio area, high walls in to stop the stiff Scottish winds, and several long benches and tables for groups to sit. During the summer bands perform and BBQs are routinely fired up to feed the hungry patrons. Caley’s is a gastro pub that serves award winning food while serving 24 plus wines and varied guest ales. Nearby to Edinburgh’s stadiums this place fills up on game day for its unique Scottish expression of pub food classics. A dark and dimly lit pub with wooden beams and brick archways that lead to a backroom covered in foreign currencies. This pub enjoys a healthy mixture of all walks of life with students mixing with workers and tourists. The pub serves great food and is a traditional Scottish pub deemed “authentic” by the locals. Port O’Leith reputation precedes it around Scotland as a party bar. The ceiling covered with maritime flags and walls decorated with life jackets and buoys doesn’t really scream out party, but the Scots don’t care. By night and the weekend without a dance floor often the dancing spills on to the very bar itself. For a Saturday night that won’t be forgotten head down to the Port O’Leith. An atmospheric student pub that features its own cinema in the back room. The cinema comes complete with a cushioned seating area where people can watch a film with a pint while being nearly horizontal. For the uniqueness of this option alone, it stands as one of Edinburgh’s most comfortable and interesting pubs.